Alberta has dozens of species of these predatory beetles. The most common are the native two-spot ladybug, and the introduced seven-spot ladybug. Ladybugs are well known aphid hunters. 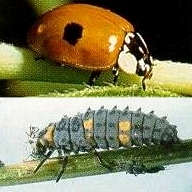 During development each ladybug larva can consume hundreds of aphids or similar soft-bodied, sap-sucking garden pests. Like green lacewings, ladybugs are commercially available for biological pest management. These predators however are more manageable in closed systems, like green-houses, rather than in the outdoors. Ladybird beetle adult (top) and larvae eating an aphid.